First post here and I have been a long time poster out on Stereophile and know that my journey as an audiophile is beginning to enter a different phase. I have been engaged in this world since Christmas of 1994 when I got my first audiophile system and I have progressed from ignorant (even about my own equipment) to being a fool (thinking I closed my gap in ignorance only to be proven wrong, repeatedly) to being mildly self aware. I know that my knowledge is minuscule and I am much more aware of what I don't know which is significant. 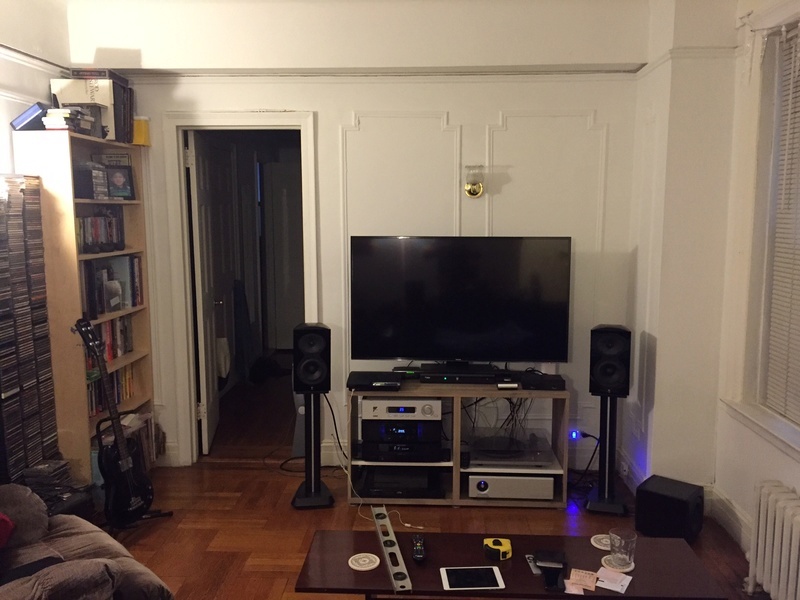 I moved about 10 months ago and after a horrible adjustment in setting up my system in my new space, I feel like I am bumping up against the limits of what I can do without tuning my room. In the spring I am seriously considering a speaker and possibly amp upgrade but I am certain without some tuning I will not get the most out of any system. Here is my current system. I am using Monoprice Balanced cable to connect the Network player to the preamp and preamp to power amp. I don't remember the brand but am using double shielded 100% oxygen free copper speaker wire and have the sub connects using speaker level inputs. Unbalanced cables are Monster THX (I had Audioquest but they won't work with the Ayre unit - RCA plugs are too far apart) and I do not recall the brand of digital coaxial cable I am using to connect the CD player to the Network player. Due to space constraints I do not have any of the equipment isolated. The cassette deck is on the bottom with tuner sitting on top of it. I then have a shelf and the CD Player is sitting directly on it with the network player directly on top of it and the preamp on top of it. On the right side I have the power amp on the bottom with a shelf above it and the turntable sitting on that shelf. The phono stage has the two boxes (it has a separate power supply) sitting side by side on top of the stand. My standard CD I use to tune in my system is Roger Waters Amused to Death. I am achieving what feels like a 20ft or so total soundstage in width but am not feeling the speakers completely disappear the way they ought to and am not getting the kind of all enveloping sound I get in a well tuned, exceptional system. On a song like Perfect Sense where I should expect to hear sounds come from all around me, it is still in front of me largely and again, there is some localization of sound coming from the speakers. I use a few others like Miles Davis Kind of Blue and Duran Duran's Decades (specifically A View to a Kill) to tune in bass and get the subwoofer just right and Genesis's Abacab to ensure that a standard record will sound great. I have experimented with toeing and rake angle (rake angle had a monstrous impact) along with small tweaks in placement of my furniture. I live in a smallish NYC apartment with a main room that is 13' x 20' with 9' ceilings. Due to the location of outlets, cable, etc... I am very limited in what I can and can't do. I have windows that are immediately to the right with blinds and the right speaker is maybe 18" off the side wall. The left speaker is about 6.5' away and due to the placement of a door is about 5.5' from the left wall. The blinds catch the first reflection off of the right wall and I have a recliner that catches the first reflection off the left wall. My points of comparison (and I know this isn't really fair) are the Raidho X-1s and Kaiser Chiaras in rooms that were larger than mine but with acoustic panels floor to ceiling at the first reflection point. With minimal effort made to get the toeing angle and spacing right, these speakers completely disappeared and you get a true 360, all enveloping soundstage. I will post pictures at a later date. Thoughts? Will those floor to ceiling acoustic panels have that much of an impact. Am I simply bumping up against the limits of my Revel Speakers. 1. I am not comfortable at all tweaking equipment beyond tube rolling. I have minimal knowledge of electronics and pretty expensive equipment which I am afraid to screw up. I built a set of speakers with attenuators for the tweeters so anything beyond point to point soldering is beyond me and I prefer to have a schematic. 2. This is a rental and I will only be in it for maybe 7 or 8 more months so any treatment can't be permanent and I would look for flexibility in a new space. Thanks in advance. I now have tweaked my speaker placement to deliver the precise imaging described in the thread about Roger Waters Amused to Death. These were relatively small tweaks to the toeing and rake angle. Additionally, I have minimal sound coming from the speakers in a localized way. I was wrong regarding dimensons. The room is 12' x 18' and the speakers are 5.5' apart (center to center) with the right speaker 18" off of the right wall and the left speaker about 4.5' off of the left wall. Welcome to TuneLand and sorry for the late response. This season has been way busier than I would have ever guessed (way too many irons on the fire ). Since your only going to be there a short time it might be fun to play with some free tweaks, or reasonable, so you can take the knowledge with you to the next place. If you find time it might be nice to share your last setup and the differences between the two. I say this because if my memory serves me you had tweaked out a bookshelf setup. Greetings and welcome to TuneLand. Might I suggest you get some RoomTune treatments to play with. They're inexpensive and do miracles for the room. They can also go with you to your next place serving you well. I recommend buying them from Harold directly. Be sure to ask for the latest version with the new seams. Thanks for the kind wishes. Probably good advice not to get crazy given that I will be moving and will look into free tweaks and simple, non permanent treatments. .
Back where I used to live, I had mostly the same equipment and the room was set up radically differently. The major change is that I upgraded from a Marantz NA7007 network player and DAC to the Marantz Reference NA-11s1 DAC. The speakers were sitting on top of bookshelves that were 6' high. The center of the tweeters were 14" below the ceiling and I had the speakers angled down and toed toward the primary listening location. 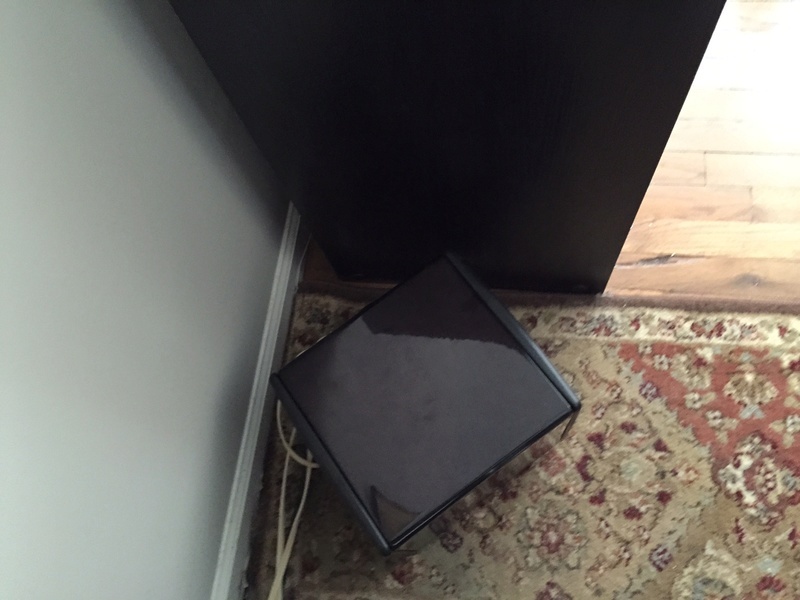 The subwoofer was along the wall about 6' in front of the speakers angled against a cabinet. Sunfire recommends the angle and I had tried it horizontally but the angle was necessary due to the sub having and active and passive radiator on either side. The placement of the sofa and the pictures had an impact on the sound. All in all, I was extremely happy. Other than what I have described, I have no other room tuning elements included. I currently do not use any tweaks and all of the equipment is plug & play. I primarily listen to vinyl or ALAC files streamed off of a PC using the Remote app via an iPad or iPhone. I listen to Classical, Blues, Jazz, Psychedelic, Punk, Metal & Progressive Rock. In no way shape or form have I altered my musical tastes due to what why system does well. I have focused on making adjustments to my system to ensure that it plays the music I like. I think, in both cases, the slave used to make the copy was just too far from the original master as the vinyl version I have sounds great but was recorded from the original master or more likely, a slave directly from the original master (pardon me if I mangled the proper language) but you should get the gist. I was really happy with the sound I was getting from this system. I had altered the setup in that room to "optimal" which is what I have in my new location. It underperformed then, it underperforms now. I have done everything in my power to tweak this to expand my soundstage to what I had without room treatment and it appears to just not be possible without room tuning. From what I recall on Bierfeldt's stereophile posting, he spent a good bit of time using the furniture in the room as treatment, moving it around to get the best results in an overall general listening environment sense. These posts bring us up to date pretty much. I will hunt for my Black Sabbath and Iron Maiden. Sorry for the side track but while looking for SBS I ran into 'The Dio Years' and had to stop and listen for a while. This collection for me represents the search that many known and unknown artist went through as we had two sides to our beings. If you look at the backgrounds of a huge list of co-contributors to each others efforts you'll find a long string that connects a ton of guys on their spiritual journeys that intertwine. Very interesting for those who are curious about the spiritual writings and the bands' riffs that took place. It's one big creative mindfest that goes all the way from 'Second Chapter of Acts' to Kerry Livgren to Ronnie Dio, Mylon Lefevre and countless names of other artists, producers and engineers. A pretty interesting mix to have been a part of and I might say one of the most interesting times as far as soundstage picture painting. What an explosive time of both recording and walks of life, to all be thrown into such a musical era. I would have to say as much as it seemed to be two sides of the fence, there wasn't really as big of a divide as there was a huge combined rock community search being explored. Which is graphically spelled out by and through the years of Black Sabbath. But this is from my viewpoint looking at a bigger than life topic. Welcome to Tuneland again from Sonic. Hope you like reading about all our adventures here. You will probably have learnt that Sonic has spent a long time wrestling with a room that has concrete walls and a reinforced concrete ceiling. Better or maybe worse, there is a large glass window that acts as a high pass reflector (that is the bass goes out but the mids and treble comes back). If it were not for Michael and the Tune, this room would be impossible. Of course, the audiophile/Stereophile will be to bring in the curtains, carpets, foam, rockwool and damp the room to the point music was dead. Anyway, I found that Corner Tunes in the upper four tri-corners and maybe an EchoTune or three will be enough to make a dog's dinner of a room into something at least passable. The good news is this stuff is very affordable especially if you ship within the continental USA and you can take them and use them in your next listening room. They mount with push pins or the 3M Command tape. 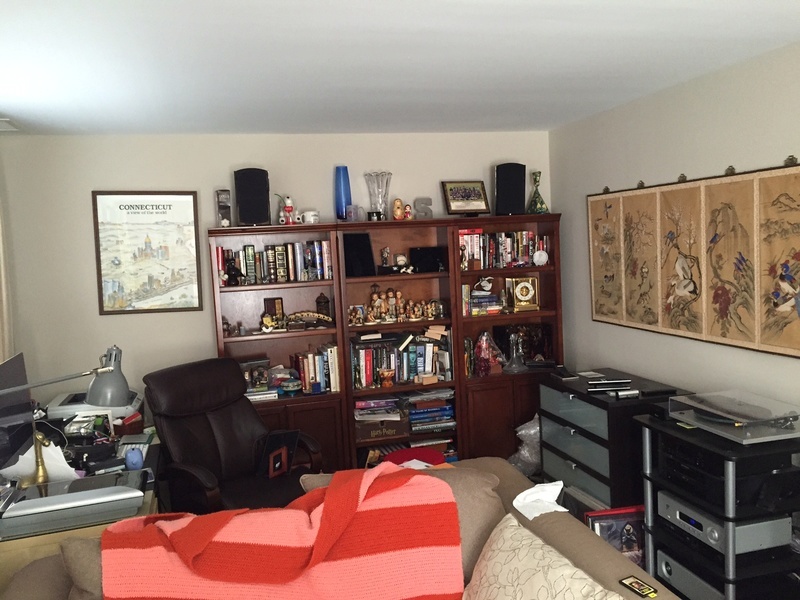 You said your room underperforms -- could you describe what is right and wrong with the sound now? I did spend time trying to place the sofa in that old room in just the right spot and the pictures on the wall, etc... to get the room to sound better. That was well within what I could do at the time. Second, the Dio years from Sabbath were spectacular. Breathed new life into a band that had really lost its way and let to three, truly fantastic albums. Heaven & Hell, The Mob Rules and later on...Dehumanizer were fantastic records. That final Heaven & Hell album wasn't quite in the same league but to have a new recording of any sort from those guys and to see them on tour one last time was quite special. Dio's voice, different vocal imagery and the hiring of Martin Birch transformed Sabbath. Technical Ecstasy and Never Say Die had there moments but Sabbath with Ozzy was just beginning the circle the drain. Sabbath Bloody Sabbath appears to be an issue with my CD release. Listening to a new LP of it sounds so much better. Sabbath had very poor control over the original recording as the band was severely mismanaged. The song The Writ on Sabotage is about them actually being served on stage saying they couldn't perform their own music. They wrestled control back but there are a lot of crappy versions floating around of old Black Sabbath recordings. Oddly, I had these unbranded releases on cassette from "Dorcester Holdings" where I guess they have the original or close to original masters and those cassettes sounded better than anything I could find until recently. My wall are plaster (building is pre-war in NYC) and I have that window immediately to the right. Despite that, setting up to spec, the room sounded overdamped. Turns out that the OEM stands have the tweeters just off where they should be and a small tweak to the rake angle and the sound opened up. My issue is that I am not getting my speakers to disappear the way I would like. I am getting localization of sound from the speakers on lots of recordings. Dynamic range (bass doesn't sound boomy and is well balanced and treble is open and airy) and detail is good but I am falling well short of the soundstage that I really want. I have been listening to speakers in showrooms lately and it feels like something to dampen that first reflection point off of the side walls is important. Every speaker I listen to that has that kind of soundstage seems to be in that environment. That is an issue in this room in that I have that window immediately to the right. If I even stack a couple pillows on the sill it helps improve the soundstage but that is not sustainable. I am thinking maybe a curtain on that side would help. You may know that in terms of approach, Tunees do not follow the "first-reflection" idea generally beloved of audiophiles. This is because we look at sound as pressure movement along surfaces rather than visualise sound like lightwaves bouncing off mirrors where "the angle of incidence = the angle of reflection". If this effect exists it will be at very high frequencies and not in the mids and bass where the motion is more along surfaces in expanding and contracting bubbles of pressure. Still if you had a pair of RoomTune panels you could set them a foot outside your speakers and about a foot and a half forward and toe them in so only their edges are seen from the listening chair, the reflective side face towards the speakers. This focus the soundstage towards you. Have you tried sitting closer to your rear wall? There is a placement that Michael had recommended where the speakers are very close to the front wall and the listener is within two or three feet of the rear wall. You are already more than halfway there. I did not know that...I am very new to the idea of tuning beyond what I have mentioned in the strings above and I know nothing about acoustics. My success in my original setup was driven by trial and error and coincidentally landed on what you described as a recommended potential setup. My original setup was as you described. The speakers were high and close to the wall (with port bungs in) while I was sitting at the very opposite end of the room. Now, that is simply not possible. I have a supplemental kitchen area behind the sofa along with a cabinet that is absolutely required. NYC apartments are stupidly small and I have had walk in closets that are larger than my current kitchen. The only reason I was thinking that the first reflection point works is because of some recent demos of speakers. That being said, even during demos I feel like the soundstage is only coming to life in a few specific cases. It tends to be a monitor, with a ribbon tweeter on a well built stand. I have watched these guys set up the speakers and they are almost haphazard about it and there is NO precision in toeing or rake angle. It makes me think it is more about the speaker I am listening too rather than the tuning and reflection point. Is it simply a situation where it is not the treatments but that type of speaker does a better job of delivering the kind of soundstage I prefer vs a floorstander? One of the dealers I was talking to was of the opinion that speaker size in particular has a tangible impact on soundstage. He feels that a because a monitor doesn't have to deal with lower frequencies it delivers a different soundstage that I like better. As I think about it, your explanation of how different frequencies reflect differently (which makes perfect sense) may be explaining the phenomenon I am hearing and it is likely less about reflection of sound within the cabinet and more about reflection of sound in the room. Incidentally, I am considering that with a move in the spring or early summer an upgrade to a different speaker. I usually get one new item a year and I was wavering between new phono stage, power amp or speakers. I was leaning toward speakers as I have found a few I really like. Methinks that will need to wait and I need to read more on acoustics and do a better job of understanding how sound behaves at different frequencies. I could easily see myself buying the speaker I like, setting them up and being horribly disappointed. Just a quick comment about first reflection points. Even though they're not really first reflection points, that side area can be very instrumental in tuning in the room/speakers/ears. BTW is your ceiling flat, or are there light fixtures and fans up there? The right and left walls are curved and there is not a sharp transition from wall to ceiling. There are two concrete "beams" that are equally spaced in the ceiling. There are no light or fan fixtures in the ceiling otherwise. Aw yes, got it now. Do you know what poster board is? If you want we can voice the ceiling a little and start to shape the sound of the room. It will take some patience on your part, but would be a cheap DIY and works pretty good for curved plaster seams. There are a few other tweaks to do but would require tapping into the plaster and you don't want to do that. If you get a chance you could post some pics of the ceiling and we could take a look at it. Also if you get a chance I would like to look at a picture of your wall outlets up close. There's a bunch of fun stuff we can do if you want to play around a little. The first is I am going to try and move in June and I feel my efforts will be better spent when I get into my new location. 1. There are some very expensive speakers that I could not differentiate and actually thought sounded worse than my Revel's. Sometimes as much as 4x as expensive. 2. I have concluded I prefer the sound of a monitor with two subwoofers vs. a floorstander. I have had a couple of conversations on this topic and wanted to see what you guys think. My experience was that with floorstanders, detail and nuance might be there but the three dimensional soundstage was simply missing altogether or would be very, very narrow. One example, I was listening to the Revel Ultima Studio IIs and in the sweetspot the soundstage was spectacular. One of the single greatest speakers I have ever heard. Move 18" to either side and it fell apart completely. Alternatively, with monitors and subs, the soundstage would be wide and deep even with seemingly arbitrary speaker placement. I listened to the Raidho X-1s. The dealer dragged them out. Set them up. They weren't even close to creating a sweetspot in that he did an awful job of placement. One was pointed almost straight ahead while the other was at what seemed like a normal angle and the soundstage was spectacular. When we corrected the angle, I could move 4 to 5' in either direction and the soundstage held together nicely and in the sweetspot was as good if not better than the Revel's. Two theories were proposed to me. First is the concept that a single box or one group of attached speakers, even with isolation between the tweeter, midrange, etc..., simply has too much vibration to create the same sort of soundstage and holographic imaging that you get from a monitor. Second is that it is rare that the ideal speaker location for mid and high frequencies is the same as low frequencies without significant room tuning. This was consistent regardless of price range and dealer I went two. It was uncommon that any floorstander outperformed a monitor with a few exceptions and it was more that the monitor under performed vs. my expectations rather than me being wowed by a floorstander. Ultimately I settled in on Raidho and got a spectacular deal on a pair of dealer demo's of the C1.1s (~60% off) which I will be picking up later this month. Thus I want to get those in and setup before I really dig into tuning since what I will need to do with these would be different than the Revel's along with the upcoming new space. To make a comment on #2 " I have concluded I prefer the sound of a monitor with two subwoofers vs. a floorstander. I have had a couple of conversations on this topic and wanted to see what you guys think." I've had the chance now to play with a few of Michael's speakers and have learned much about the room-speaker interface that I never knew before or even thought possible. Some of the questions and thoughts I've had in the past have been turned upside down then right side up again. Because of this, never again will I try to make a speaker fit a room or vice versa. Rooms and speakers were meant to be one. Reading Mr. Green is one thing but experiencing the tune with Michael around is like attending the Yale of listening. The first lesson learnt is that a tunable system can achieve any sound the listener wants to go after. This statement for me and my wife seemed far fetched until MG himself took us on the most important musical trip of our lives. My advice for any audiophile would be plan a visit to Tuneland before making any serious audio move. I guarantee you'll never make an audio purchase the same way as before you visited. I want to be sure the place is comfy and cozy and not looking or feeling too much like a tuning factory this time around. Let's see if I can achieve that goal in a couple of months and then we can revisit the "when?" issues. So it has been a year and I have finally moved into a place that I will be staying for several years. 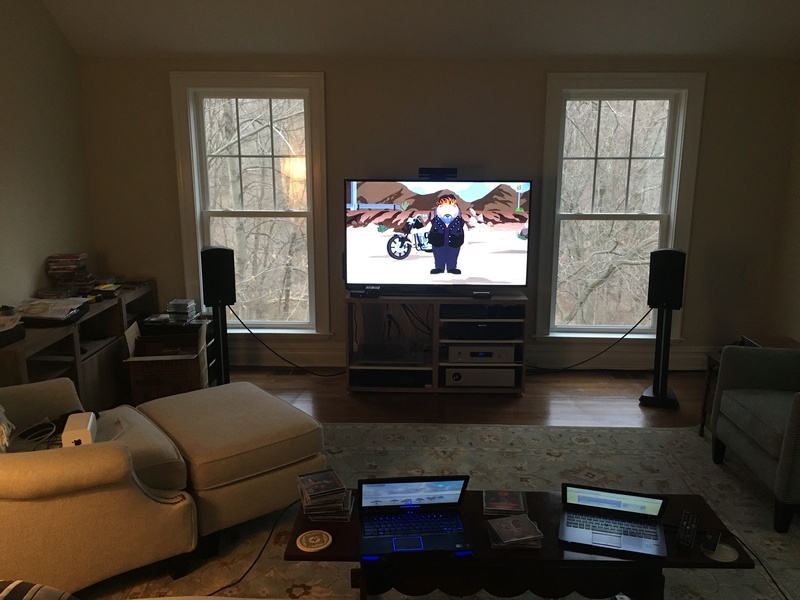 I will be posting pictures as the room comes together but made some tweaks to my system and am going to do my best to try and tune things in as I go. Since I never really use my tuner or tape deck, I have retired those due to a need for more space. And with the NAS, it will render my CD player moot so that is going up on Audiogon as is my old Vincent Phono Stage. I am re-converting everything to FLAC files and will have a clean, consistent library. I am going to install a NAS in my Apple Airport Extreme router. What software will support a NAS best? Will Roon work? The Bridge II is Roon ready but I don't want to have a PC running all the time. I just want to access data off the NAS via an app on a tablet. What about mconnect or PLEX? Any experience? I would love to hear a POV on the value of line conditioning and voltage regulation. Everything I have read seems to indicate that line conditioners deliver minimal value and voltage regulators are the way to go. Something a Panamax 5400-PM. The question then is an AC Regenerator worth it? Is it that much better than a voltage regulator? The price is certainly higher but will I actually notice a difference. Additionally, I was looking at the new Rega NEO PSU. With the voltage regulator, I will likely get minimal benefit in terms of cleaner power but it looks like I might be able to fine tune the speed of the turntable. I guess this would only be valuable if I confirm my table is running slightly fast or slow or I was switching between speeds regularly. I need to add curtains and blinds - but here is how things currently look. The CD Player is going to be removed, the PS Audio Phono converter is going in an I have a Panamax M5400-PM line conditioner and voltage regulator on order and will likely put the TV on top of it. The ceiling is vaulted and is probably 20' high at its highest. The room is 16' wide. Okay, so yesterday I was taking measurements and I have a largely flat frequency response curve both at 1M and the listening position with two exceptions. I have a 5dB spike at about 120hz and a 5db trough at about 75hz. Placement drove some fluctuation both in terms of frequency where the peak and trough occurred and intensity. No shift smoothed either of these out. The reported values above are based on where the speakers sound best in the room. I go basically the same values with two different pairs of speakers. What kind of room treatments would you recommend to potentially flatten this out? A dip at 75hz….right where so much weight resides in music…..that is not nice…. Sonic's system once suffered this exact thing - an upper bass peak and a bass dip. In my case it was 110 hz (peak) and 60hz (dip). I fixed the problem in the end through placement. Some rooms have this odd effect of throwing their bass to the boundaries, so the bass pressure zones are at the side walls and there is great bass there bit where the listening seat is, you get a Zero low end. My room has this effect/flaw and yours might too. And another possibility might be bass leaking out the glass windows behind the speakers. Glass acts as a high-pass filter, bass leaks away, the mids and trebles reflect back. I solved this by hanging bamboo blinds on the windows. This is how to test if your room "throws bass to the sides" – run your frequency sweep again but this time sit yourself (and/or your measuring mic) within a foot or two of either side wall. Hear if the bass fills out near the walls. In my case the dip at 60hz turned into a strong rise that kept going to slightly under 40hz. What Sonic did was to bring my speakers from what was a conventional 3 1/2 feet from the side walls to something like two feet. This was to get them into the pressure zone in order to energise the room (which affects what you hear at the listening spot). As a result, the dip was mostly gone at my listening spot and the upper bass rise also reduced so I got an acceptable bass quality and extension down to 40hz. The room treatments that I applied are to “work around” the near-wall placement to get a good centrefill, imaging, soundstage and ambience. If this doesn’t work, perhaps subwoofers from Michael with his tuneable crossover and plate amp may be the way to go. Subwoofers are good in that you can place your main speakers for the best imaging and upper bass/mid/treble balance and place the sub in another spot where they can pressurise the room best for best low end. First thing I would do is Tune the room's basics. A TunePak plus 2 extra EchoTune. Nice view with the trees outside! Thank you for the tip. I will move the speaker closer to the sidewall and see if that helps. I have discussed getting blinds for the windows and need to agree to a style with the wife. Seems like coming to a reasonable solution should be possible with her. Regarding the kit, can I get those panels so they can be primed and painted? How do they attach to the wall? Traditional drywall anchors or some other method?